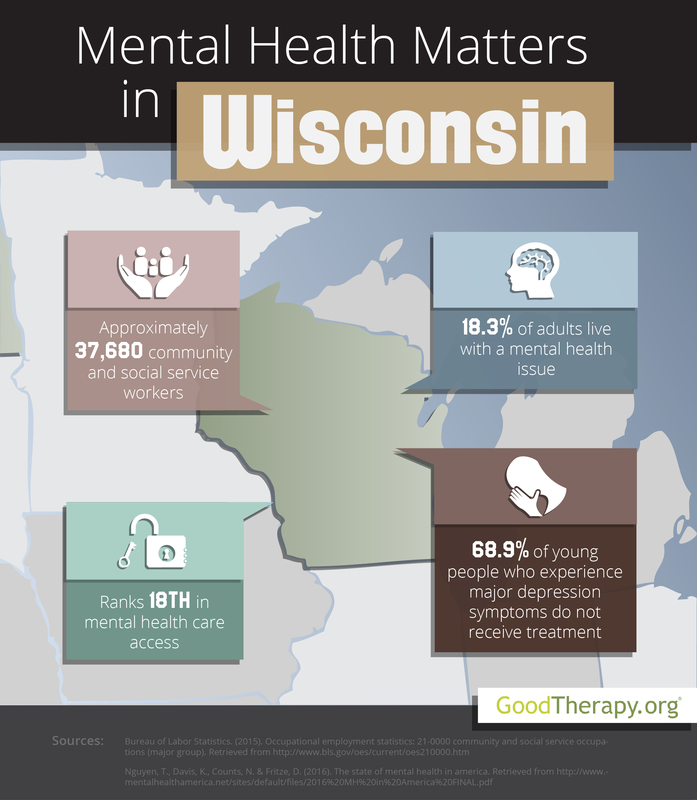 Find a therapist in Wisconsin with GoodTherapy.org. Surveys conducted by the U.S. Census Bureau found 5.77 million people lived in Wisconsin in 2015. About 37,680 residents were employed in jobs involving community health and social service. Every year, researchers at Mental Health America (MHA) investigate and compare the mental health conditions of all U.S. states, including the District of Columbia. In the 2016 MHA report, Wisconsin was listed in the 37th position in overall mental health. In other key mental health categories, Wisconsin finished 44th in youth ranking, 20th in adult ranking, 47th in prevalence of mental, emotional and behavioral issues, and 18th in ease of access to professional care. Despite a more mid-range rate of access to treatment, Wisconsin’s lower overall ranking likely comes from its high prevalence of mental health issues. Therapists in Wisconsin and major mental health organizations have recognized that substance abuse issues significantly affect adolescents and adults in the state. According to the 2016 MHA survey, 6.2% of the young people in Wisconsin abuse alcohol or drugs, while 9.7% of adults in the state have similar health concerns. Wisconsin was ranked 39th and 43rd in these respective measures. The Substance Abuse and Mental Health Services Administration (SAMHSA) claims Wisconsin’s percentage of cigarette use among adolescents and binge alcohol consumption among residents ages 12-20 were both higher than the respective national averages from 2012-2013. Heavy alcohol use among adults residents 21 or older was higher than the national percentage from 2009-2013. In addition to these behavioral concerns, there is also a high prevalence of depression symptoms among young people in the state. The 2016 Mental Health America report states 11.4% of adolescents experienced episodes of major depression in the past 12 months, and 10.5% are currently experiencing severe depression symptoms. Wisconsin was 49th and 50th in these specific categories.